I first met my demon the morning that Mum said Dad had gone. 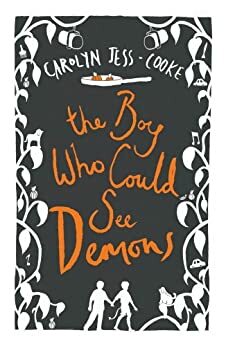 An innovative and richly imaginative new novel from the internationally acclaimed Carolyn Jess-Cooke, for anyone who loved The Curious Incident of the Dog in the Night-Time and Room. If you would have asked me what I rate this book before Chapter 28 I would have given it 5 stars and then some. I've been looking for a book to give me the heebie jeebies and while this book was not written to be scary, it successfully had me looking for monsters in the dark corners of my house. I couldn't put it down and loved puzzling out how I felt it was going and what the ending would be. And then that last fated chapter... I hesitated even giving this 3 stars as I cannot in good faith recommend it to anyone, but had such fun reading it that I couldn't dismiss it completely. I was left with such utter and complete disappointment to a book that gave me such high hopes that I was actually a little depressed. Like I said, I can't recommend it - I would hate for someone to love it the way I did and then hit that ending - it was like walking off a cliff. I never saw it coming. I don't do recommendations ever, so take what I say and acknowledge my sincerity. This book is one that I will buy in hardcover so I always have it. I will also acknowledge it as the first book of my 2015 best of list. It was that good. It's 3am and I already can feel the lack of sleep, reading to long with no lights headache forming and I don't even care. I'm in a post-book hypnotic haze right now so I will have to re-read some parts of this book, but it can wait until tomorrow. I'll re-read it and let you know if I change my mind on the rating. My apologies if I sound like I am rambling but it's almost 3:30am and this book made me fall into a hole for two hours. 4.0 out of 5 stars"The mind is its own place, and in itself can make a heav'n of hell, a hell of heav'n"
Anya is one of the ranks of the wounded healer. Throughout the history of psychology, people who are themselves hurt or crippled by the world take up this profession to help others like them. Ominously, Anya has been called to the aid of Alex on the anniversary of her daughter's suicide. In this harrowing book, Anya struggles with the demons that Alex sees while second guessing the hallucinations that her daughter had told to her. This book engages the dealer in that deepest of fears, can our souls be pursued by demons? In the very real pain of schizophrenia, what would the answer mean? 4.0 out of 5 starsInteresting story, disappointed in the ending. Maybe its was because a previous reviewer had spoiled the ending of the story for me. I was really hooked on the characters and the story line. 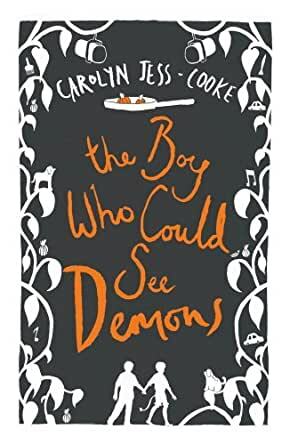 The character of the demon was very interesting and the way the story was written I was totally able to see how the child's (Alex) experiences were reflected in the way he described the demon. The ending held no surprise for previously stated reasons, and I felt the story would have been better if the original thread were continued instead of the 'surprise'. Still, it was a good read and I did enjoy it. I would still recommend it to others. This book takes off on page one. I was half way through it before I blinked. Part horror, part mystery, part drama, this story explores mental illness as well as the long term psychological effects of trauma. The story is set in Northern Ireland where adults and children are still reeling from exposure to years of violence and loss. Enter the character Anya, a psychiatrist who's also experienced great personal tragedy. And young Alex, her patient who claims to see demons and seems to share much in common with Anya's daughter, who suffered from childhood schizophrenia. These characters are beautifully written. This story is emotional, disturbing, and amazing. I highly recommend reading it.